After the Free Access to FaceBook offered by Reliance Communications now another GSM Mobile Service operator Videocon Telecommunications Limited today announced the launch of free mobile browsing on the new 0.facebook.com site for its GSM mobile service subscribers in India. By sponsoring 0.facebook.com Videocon Mobile Services is enabling its customers to stay connected through Facebook with their friends and family from any mobile Web browser without incurring any data charges. Facebook’s 0.facebook.com site is optimized for speed – it is a new faster, lightweight version of Facebook’s mobile site m.facebook.com. The site does not have graphics or photos and 0.facebook.com’s pages have been designed for performance on the Videocon Mobile Services network. Videocon Mobile Services, the next generation GSM services brand from the Videocon Group, is committed to extending the Group’s innovation-driven legacy by delivering an enriched mobile service experience to its customers. The collaboration with Facebook and the launch of 0.facebook.com on the Videocon Mobile Services network is an integral part of the brand’s focused strategy around next-generation mobile value added services designed to reach out to socially active consumers. 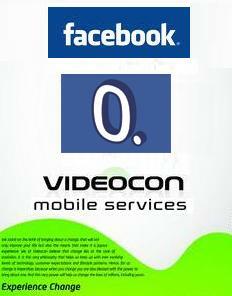 “Videocon Mobile Services is delighted to partner with Facebook to make 0.facebook.com available to users in India. Social networking has become an integral part of today’s consumer’s always-connected lifestyle and faster access to Facebook on a mobile phone will definitely offer an enhanced experience. The launch of 0.facebook.com on the Videocon Mobile Services network will enable our customers to experience the change with faster, any-time social connectivity with their peers at zero cost. This launch is in line with our commitment to offering a unique and value driven experience to our customers.” said Mr. Sunil Tandon, Chief Marketing Officer, Videocon Telecommunications Limited. launch it soon docomo….. i had used it today through rgsm…. fantastic experience with good speeds too…. really love this sort of innovations… its the time when most of indians are shifting to facebook from orkut…. Yes u can use Aircel Pocket intenet on Pc Also as i m using it. But its too slow.